A day which celebrated cancer survivors, worked to inspire the recently diagnosed, gathered support for families and friends, and reached out to the community. In our lifetimes, we will all be touched by someone with cancer. 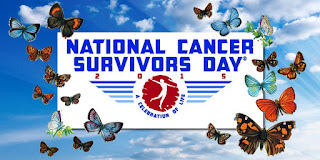 And, yesterday, we were meant acknowledge all those who have, do, and will struggle to survive. A day dedicated to supporting the community of survivors as well as their families, friends, and caretakers. But, that was yesterday. Today is today and tomorrow will be tomorrow. Surviving is constant and challenging. It is powerful. It touches and changes us all. It evolves and truly is ongoing. It exists in each day, not merely the beautiful ones dedicated to noticing. Yesterday, I hope we all took a moment to honor and embrace a survivor or our love of someone lost, who survives in our memories. And breathed brave in honor of survivors all over the globe. But, I hope we all remember today, and tomorrow, to continue to fight all trauma and illness, That we all find the will each day to endure and survive, That we all find the strength to heal and give love. We are all survivors and we are united.